Now I know some of you will not be fans of print trousers and I must admit that it took me a while to realise how versatile they can be. The blue swirl print ones I am wearing above I bought last year from People tree (a sustainable fashion brand I only recently discovered). This year’s version here. 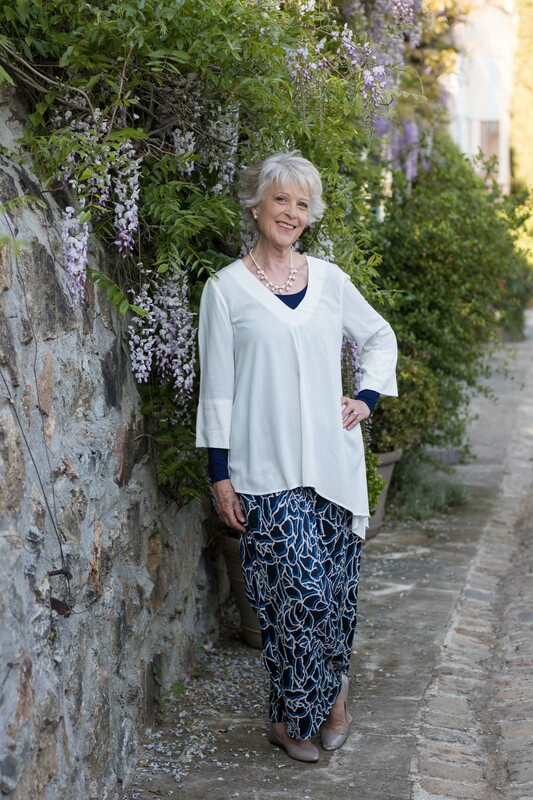 Both the trousers and top have been extremely useful as part of my capsule travel wardrobe this trip. The fabric is Tencel, which washes well and feels cool even when the temperatures rise. 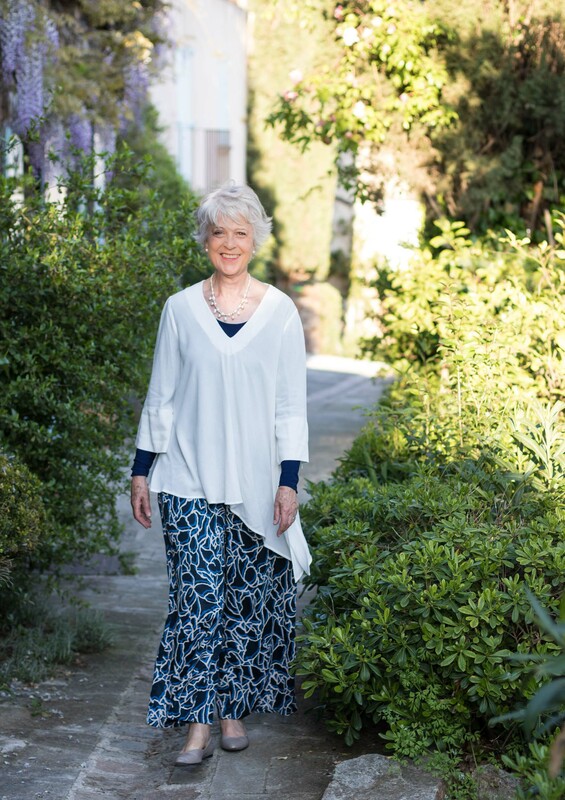 When I put on my asymmetric cream top originally from John Lewis (similar). I realised that it was slightly transparent so I popped the Hopefashion foundation scoop neck top underneath which solved the problem of the print trousers showing under the top. I love the way the trousers are floaty as you walk. You can see how I wore more formally with a cream tailored jacket here. New haircut I had it trimmed last Saturday by the lovely Sandra at Jean Louis David in St.Tropez. What is it about a great haircut that makes us so happy. 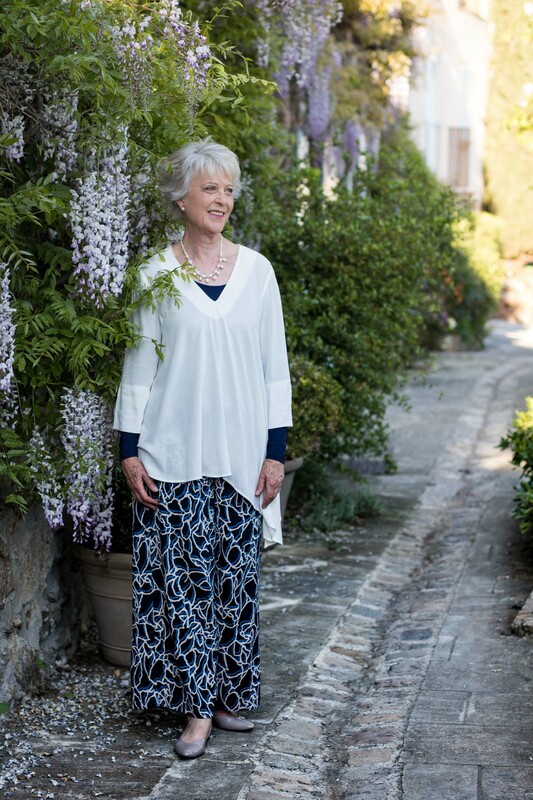 If you are petite I would suggest sticking to narrow or Capri style trouser. A friend of mine wears her patterned trousers very successfully. 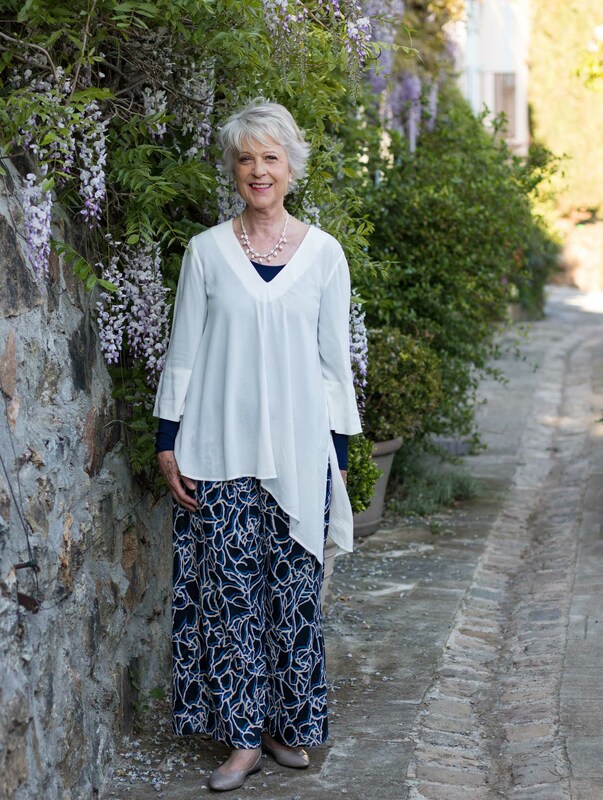 Personally, I prefer the wider palazzo style as the fluid fabric is more forgiving over my hips. 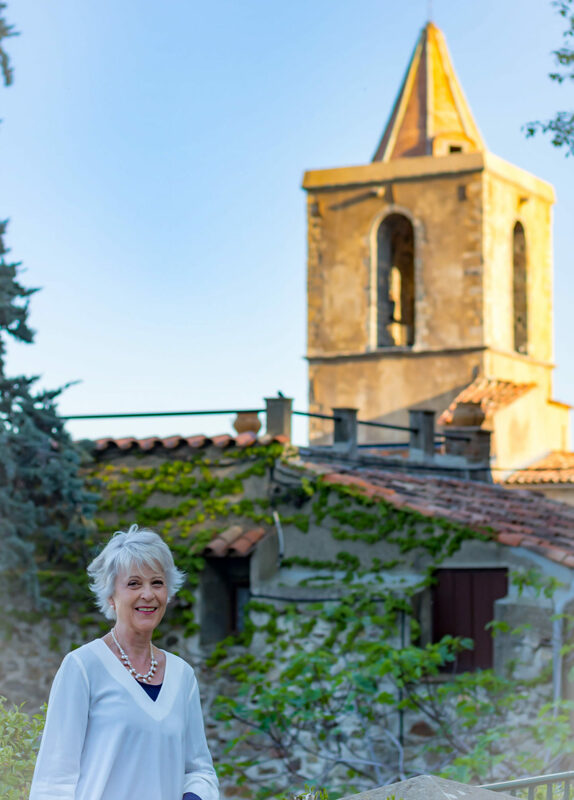 I shall miss the balmy evenings and the soft light of the South of France when I return to London at the end of this week. I shall be back again in late June with more news and views. PS. Just to let you know that the navy lightweight Parka by Hopefashionuk I wore on Pampalonne beach has now been reduced by 30%. A good deal in my opinion but hurry offer ends midnight tonight. I don’t know which is prettier the WISTERIA or YOU! I agree! Both are beautiful! I agree with the previous post! Wisteria is one of my favourite plants and you do look very lovely. I’m petite and this is the sort of outfit that would make me look huge, my legs are just too short. I had some cut-off printed trousers with red& white roses & green leaves on a navy background which I liked (and my sister hated!) Trouble was you could really only wear white with them as otherwise the look would be just too bold so not very versatile on holiday. Now I stick to plain trousers and patterned tops! I love that outfit – really stylish! Your hair looks terrific too! 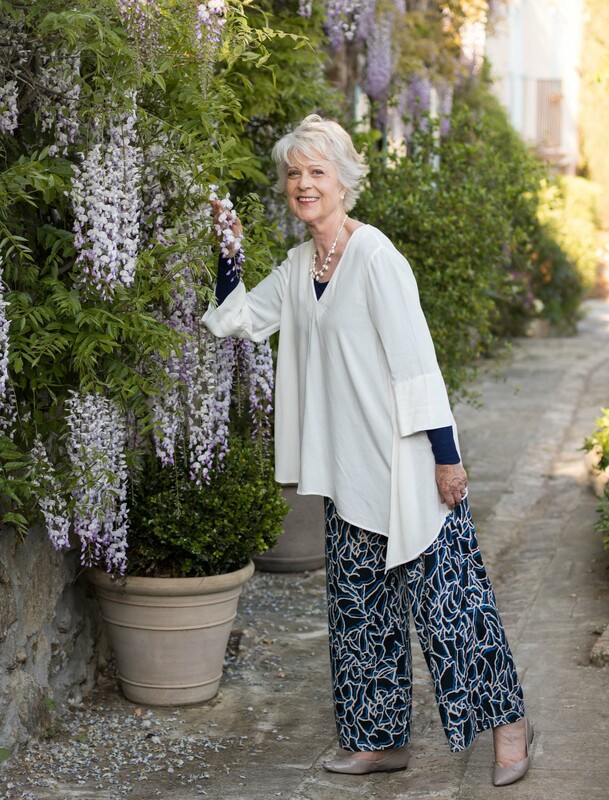 You look lovely as always and that wisteria definitely creates a bit of competition! 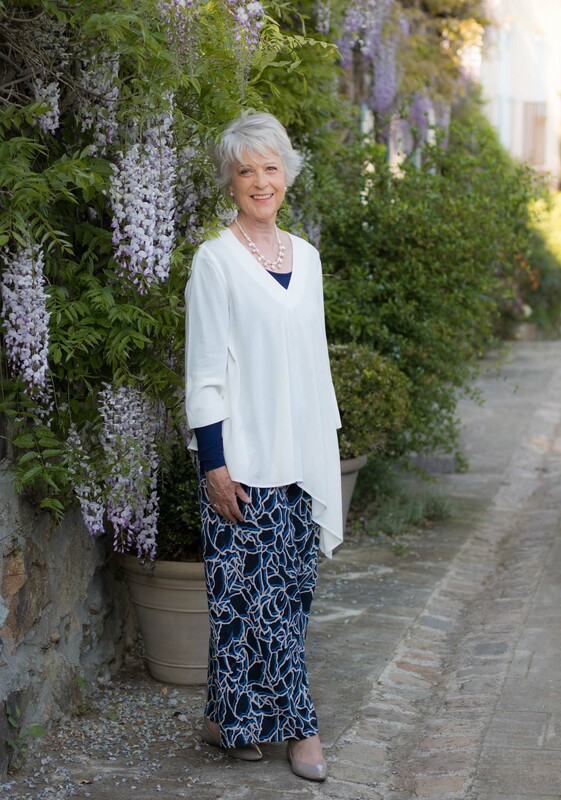 I have a pair of blue patterned straight leg pants that are great for vacations and around home as they don’t show marks as plain ones do! They have also been surprisingly versatile as well. Love this look. It’s something I will definitely be trying to copy – if I can find the right trousers. Your navy ones are lovely but I’m not keen on the bright blue ‘Susie Floral Trousers’ that your link takes me to. Any other suggestions? I agree Jasmine I prefer last years version. Having said that I am also tempted to buy the light blue version. It will be good in France. I have had a look round and have put some options at the bottom. M&S had some reasonable looking ones. This is such a lovely look for you!! I have only just discovered Tencel and find it very comfortable and it is sustainable. Prettiest outfit I have seen on you, soft drapey, and oh so feminine! Love your floppy, flirty hair 2. I’ve been thinking of trying print floating pants and you have inspired me to get going!